What’s a pelagic school of fish? The term “pelagic” refers to fish that live neither close to the bottom (called “demersal” fish), nor close to the surface, nor on a reef. 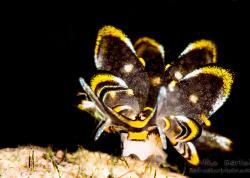 They are the fish that we see at open water dive sites subject to currents and chance encounters with large marine life. We are all familiar with and in awe of the sheer vastness of the oceans. Approximately 98% of the world’s total water volume is below 330 feet (100 meters) - a vast expanse that makes up the largest aquatic habitat on earth. 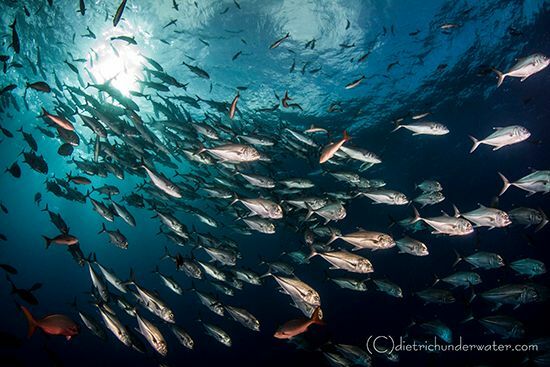 The open ocean is a home to pelagic fish that comprise approximately 11% of all known fish species. The range of pelagic fish is almost (but not quite) as vast as the oceans. Pelagics range from small coastal forage fish such as sardines and herring to larger fish like swordfish and tuna, along with apex predators like oceanic sharks. 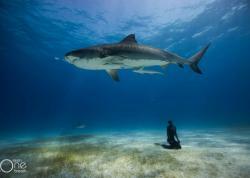 Regardless of size, they are generally agile swimmers and have streamlined bodies. Many pelagics that live above 660 feet (approx. 200 meters and referred to as epipelagic), have a silvery appearance that almost gives the fish a transparent quality that helps in their survival. Pelagics are always on the move, constantly swimming and following food or water temperatures. So how do we find these oceanic wanderers and bring some amazing images of them back to land? 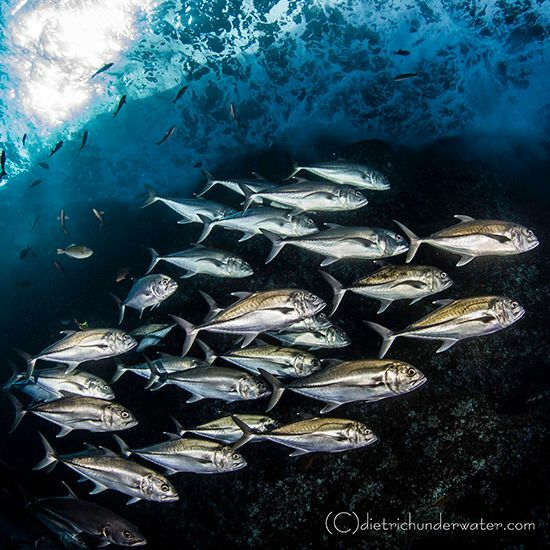 This school of Bigeye Trevallies show off the silvery countershade many pelagics have. A sunburst and diagonal lines add energy to the image. A wide-angle setup is the way to go for pelagic fish schools. When shooting a DSLR with a crop sensor, my go-to lens is the Tokina 10-17. I almost always have the lens set at 10mm to get the 180 degrees of coverage that setting offers, and I’ve had great results. When using a DSLR full frame camera, there are a few different options. The lens I recommend is the Sigma 15mm, which can be used with Canon or Nikon bodies and has received applause from users and reviewers alike, many who believe it’s a better lens than those made by than their Canon or Nikon counterparts due to it’s ability to focus closer. With any other type of system, the widest lens/dome combo or wet lens available for the system is recommended. Read more on the best wide-angle lenses. Now that we have the right gear, let’s move on to settings. Shutter speed controls the darkness/lightness of the background of the image, so it can have a huge effect on the final product. The shutter speed you choose may vary depending on whether your pelagic subject is moving (i.e. fast school of fish) or more still (i.e. school of jacks). For slow-moving or still pelagic fish, a slow shutter speed (1/125 on a DSLR) is favored. This allows more natural light into the camera, which shows the pelagic’s true environment instead of just a dark background. When shooting a fast-moving subject, I’m more likely to shoot closer to 1/200 (or 1/250 depending on strobe sync speed) to let in less background light and give a more dramatic effect to the image. Another important setting to consider when shooting pelagics is the F-stop (aka aperture). As the F-stop increases, the light coming through the lens decreases. Whenever conditions allow, I like to use the sun as a backlight when shooting pelagics. This means that I need to stop down to F16 or above, receiving added depth of field as a bonus. If shooting away from the sun, I use a smaller aperture in the F8-F13 range. I always recommend two strobes (a single strobe isn’t powerful enough to cover the area when shooting wide angle). Two strobes take care of filling in the foreground, while natural light to illuminates the background. 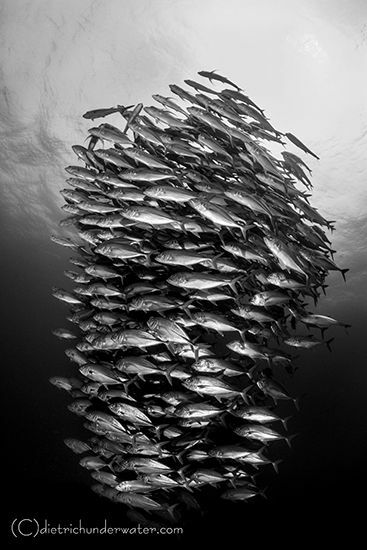 Pelagic schools of fish often swim in tower-like formations, making great vertical images. Learn what your particular system can do, and more importantly, what it can’t do. Practice the controls on the housing so much there will never be a question whether you are pressing the right button or turning the wrong dial. Think of your camera as another piece of dive equipment - learn it and treat it with the same respect. When you see the school of pelagic fish, don’t race to get to them. If that’s the approach taken, chances are by the time you reach them...well, you won’t reach them because they will be gone. Breathe and gather your thoughts. You may be in awe of the beauty and graceful movement of the school, but think. See the shot in your mind. A slow, easy approach will make a better image...because the subject will actually be in the image. When shooting wide, it’s not wise to depend on TTL settings to make your images great, as TTL is not as reliable as for macro with more static subjects. I always recommend shooting with manual settings. The Most Important Tip: Take Chances! I’ve met so many people who are intent on “just getting a shot”. I tell my students to use their imagination, to try different settings and really think outside of their comfort zone. Photography is an art. A little experimentation with angles, with different settings or composition is a good thing! When you can let go of the pressure of “just getting a shot”, you may end up getting THE shot. 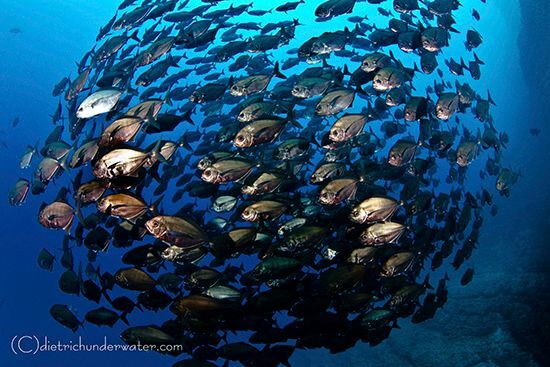 A school of trevallies swims together in the open ocean off the Socorro Islands. Want to dive in Socorro with huge schools of pelagic fish, mantas, whales and more? Check out UWPG's Socorro underwater photography workshop in March 2015.